Even as you strive to keep your house neat and cleans, there are still certain substances in the air that are serious hazards to your health. When inhaled, these toxins in your home can cause a wide range of health problems. Even worse, they can compromise several bodily organs, including your adrenals. You may not realize it, but several toxic substances lurk around you and your family. These toxins are typically present in a lot of items, particularly household cleaning products, personal care products, beauty products, and even food packaging. In addition to phthalates and lead, mercury, asbestos, and BPA are some of the most common toxins in your home. Each carries its own health problems, and all have been shown to have a serious impact on your organs and your ability to cope with stress. Mercury is typically present in various construction materials. These include cement and metals. You can also encounter mercury when you undergo some dental procedures such as getting amalgam fillings, metal crowns, and metal braces. The risk of mercury exposure is also high when you get some medical laboratory tests done. In addition, the mercury in the air also tends to get deposited in the water. In fact, according to the University of Wisconsin Eau Claire, it was estimated that 32 metric tons of mercury were deposited from the air into water and soil around the U.S. in 1995 alone. Hence, there is a good chance that the water running in your faucet at home can contain mercury. Mercury is also known to be present in some foods, particularly fish such as albacore tuna, swordfish, king mackerel, and tilefish. Asbestos is a natural mineral known for its extreme durability and ability to resist most chemical reactions, including fire. This is precisely why asbestos is currently being used in so many homes and buildings today. There are six well-known types of asbestos. These include the chrysotile, which is the most common type of asbestos. It is typically used in various commercial and household applications, including roof materials, ceilings, walls, and flooring. There is also a form of asbestos known as amosite, which is predominantly used in the construction industry. 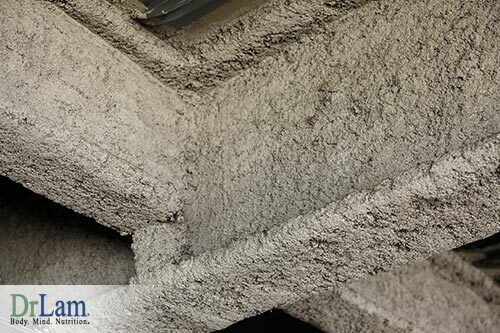 This particular asbestos type is present in pipe insulation, ceiling tiles, and cement sheets. Another form of asbestos known as tremolite is causing significant concerns among consumers, especially mothers. This is because tremolite has been detected as a contaminant in talc powders, which are applied to babies. More than three million tons of BPA are manufactured every year. This synthetic chemical has made its way to a variety of consumer products, including sports equipment and water bottles. Not only that, but certain thermal receipts and even paper currency contains BPA. According to the United States Environmental Protection Agency (EPA), the concentration of these pollutants are typically two to five times higher inside the home. Unfortunately, people get significant exposure to these since 90 percent of their time is spent indoors. As exposure continues, your health may start to deteriorate. In some cases, breathing toxins constantly can even trigger adrenal fatigue. You may not realize it, but some common toxins in your home can be associated with adrenal fatigue. In fact, science has made some startling discoveries regarding how significant toxin exposure can affect your adrenal glands. While Adrenal Fatigue Syndrome (AFS) is typically triggered by chronic stress, the accumulation of toxic substances in the body can also contribute to and worsen this condition. This is because toxin exposure can inhibit or block any adrenal hormone process that typically helps the body deal with stress, thereby interrupting your normal NeuroEndoMetabolic (NEM) Stress Response. It can also worsen liver congestion and extracellular matrix pollution. Some researchers with Dental Amalgam Mercury Solutions have discovered that mercury causes some hormone problems affecting the adrenal glands. During times of stress, the adrenal medulla produces the fight-or-flight hormones epinephrine and norepinephrine. When stress is prolonged, the body ends up experience an imbalance in these hormones. As this happens, mercury accumulates in various areas of the body that are already inflamed or stressed. One of these areas is the adrenal glands. As asbestos is inhaled, it gets transported to the lower reigns of the lungs. Over time, it can cause fibrotic lung disease or asbestosis. When this happens, the lungs will become unable to effectively eliminate carbon dioxide from the body. Because of this, the acid levels in the blood can build up, contributing to acidosis. As a result, the kidneys end up working harder to eliminate the acid load from the body, while the adrenal glands may need to increase cortisol production to reduce the inflammation triggered by the toxins, eventually leading to adrenal fatigue. Aside from this, continuous exposure to asbestos can also lead to mesothelioma or asbestos cancer. This develops in the linings of the lung, heart, and abdomen. Several studies found that the adrenal glands are among the major sites for mesothelioma metastases. Exposure to BPA is said to affect adrenal steroidogenesis among adults. This is a process which involves the synthesis of adrenal androgens, mineralocorticoids, and glucocorticoids such as the stress hormone, cortisol. One study conducted by Université du Québec in Canada has found a correlation between BPA exposure and disorders affecting the hypothalamic-pituitary-adrenal (HPA) axis. Furthermore, a correlation was also found between BPA and metabolic syndrome, which can cause increased blood pressure. Continuous exposure to toxins in your home can contribute to the development of AFS. To avoid this from happening, you need to think seriously about lessening the level of toxicity at home.